The Muller-C is a heavier-weight bassoon reed preferred by many experienced players. The higher cane density of this design gives a bassoon reed with plenty or heart and substance. The medium shape gives a good tonal breadth and a balanced response over all registers. Overall these features combine to offer a substantial bassoon reed with a rich dark medium-broad tone. 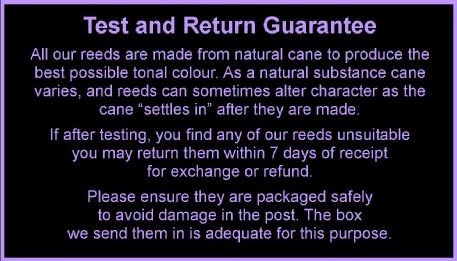 C reeds are alternatives to our standard bassoon reeds which aim to create a similar result using a subtly different balance of design characteristics (eg. shape, gouge, profile). Why not bookmark this page. Want a mix of reed styles?